What does the Aldabra tortoise look like? The Aldabra tortoise usually has a rounded and dark colored carapace with bumping up pieces and stunning patterns. Scientifically named Aldabrachelys gigantea, as the name suggests they are one of the biggest tortoises in the world. The average weight of the adult male is approximately 550 pounds. There are some exemplars as heavy as nearly 800 pounds. Where is the Aldabra tortoise found? The Aldabra tortoise can be found on the islands of the Aldabra Atoll, in the Seychelles Archipelagos, north of Madagascar. They can have a varied habitat on their home and introduced islands. They naturally live in environments ranging from coastal dune areas and mangrove swamps to scrub forests and grasslands. What food does the Aldabra tortoise eat? Same as many other tortoises, the Aldabra tortoises are mostly herbivores. In their natural environment they eat plants, grass, leaves, stems and weeds. They can also feed on some insects and dead animals. In captivity they prefer to eat all sorts of leafy greens, flowers, grass, cactus pads, and of course, the commercial tortoise food. They also like melons and other fruit. 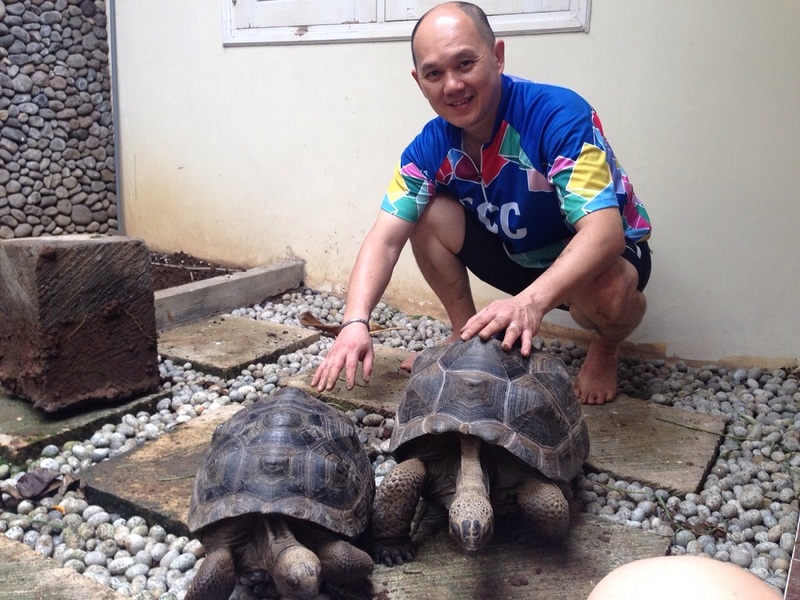 These two happy Aldabra Tortoises belong to Soefianto, and they are happily living in Indonesia! The Aldabra tortoise usually breads between the months of February and May. The females lay anywhere from 9 to 25 eggs. But usually only less than half of the eggs are fertile. The Aldabra tortoise female can lay eggs multiple times in one year. After the incubating period, the small tortoises come out from the eggs between October and December. In captivity, for Aldabra tortoises the artificial incubation works the best. If you incubate the eggs at temperatures between 81 to 86 degrees, the incubation time will be less, about 90 to 108 days. Aldabra tortoises have a very high longevity, for an average of 100 years lifespan. In some known cases they have reached more than 200 years of age. The oldest known Aldabra tortoise in captivity at the present time is 170 years old. You can buy Aldabra tortoises at reptile shows, reptile stores, and on the Internet. If you decide to choose an Aldabra tortoise as your home pet you will find it very rewarding. Aldabra tortoises usually spend the mornings and early evenings eating, and they like to spend the hotter parts of the day in the shade or in shallow water holes. They can be very quick when they want to be and if frightened they will actually sprint away. But if you have a treat for them they will come fast to you. An Aldabra tortoise should be kept in an environment close to its natural habitat as much as possible. It should be a grassy area, with some special places for shelter from the hot sun. The best way to house them is usually keeping them outdoors. The small tortoises up to 2 years old can be kept indoors, but once they get older they need to roam outdoors. For small tortoises up to a year old, is recommended to lodge them in tortoise tubs. For the bottom of the enclosure you can use bark or crushed coconut. At one end of the enclosure provide a hotspot of about 90 degrees Fahrenheit and leave an ambient temperature of about 80 degrees. You can use mercury vapor lights to heat the enclosure, as they provide both heat and UV, all in one fixture. Aldabra tortoises can get very large, so it is better to use a big outdoor enclosure. Depending on how many tortoises you plan to have, the paddock’s size can vary. Install heat emitters, heat lamps and large outdoor heat pads in your tortoise house, to maintain a proper temperature even for the seasons when the weather outside is colder. 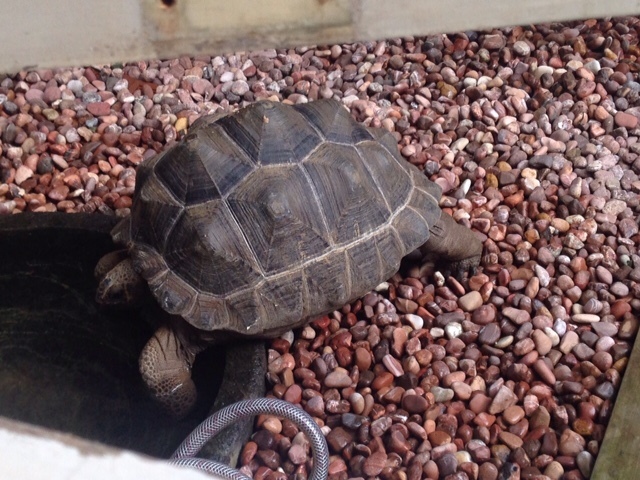 It’s good to have an entrance to the tortoises’ house large enough for the tortoise to enter and exit easily. A door is practical way to lock the tortoises inside their house on very cold days or nights. It’s good to know that the Aldabra tortoises love mud holes. If you can build a mud hole or a shallow pond for them they will be very happy. They are also good swimmers, unlike most tortoises. The Aldabra tortoises need lots of space and special habitat setups. But they are very rewarding pets if you have the proper time and space to dedicate to their needs. They are smart and very entertaining.